This is just in case you think I'm serious. I'm not. This is an official foot-pop-manure-throw over the fence into the garden. This is what real housewives do. :) This picture is from a while ago, but a friend just recently sent it to me. I was laughing hard thinking of us out there in the morning doing weeding, manuring, and enjoying a visit over the roosters crowing. Spring mornings in Sacramento are fabulous. I'm missing a little bit more sunshine, but I know it will come here in Portland. In the meantime...don't worry about a little bit of poop. 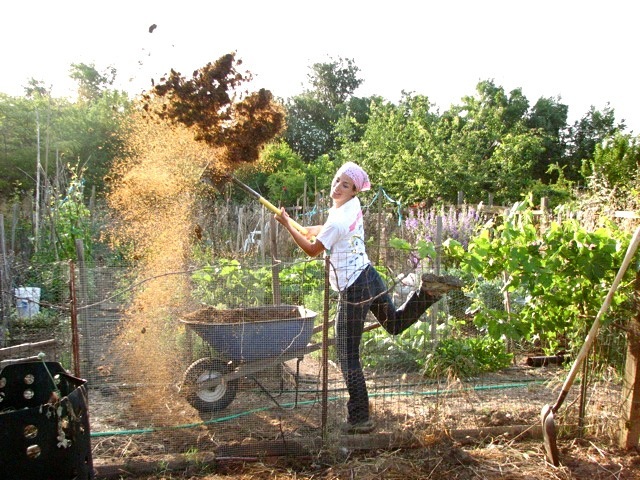 Hey Bonnie Belle, we Siegs sure know how to appreciate good manure! I don't know what James loves more, the actual garden or getting to work with cow poop beforehand. :) Thanks for your nice note on my blog! I decided to take a more active part in the whole blog world. We'll see how it goes. Any tips are of course appreciated. :) Also, I threw your button on my blog. I only have four followers so that isn't saying much, but I thought it couldn't hurt. :) I hope your last week or two of pregnancy is going well!